Piranesi lives in the "Garden of Satire"
...since Piranesi came to live at the top of the Spanish Steps, he may then have placed the Horti Luciliani purposefully in the same location within the Ichnographia. If this is so, then Piranesi deliberately places himself (figuratively) within the garden of the father of Roman satire. ...find the exact location of Piranesi's home, check its locationon the Nolli map, and then find the exact location within the Ichnographia. ...not sure if the exact spot will be significant, but it will be good to know nonetheless. ...I'm not absolutely certain that this is where Piranesi lived in 1757. 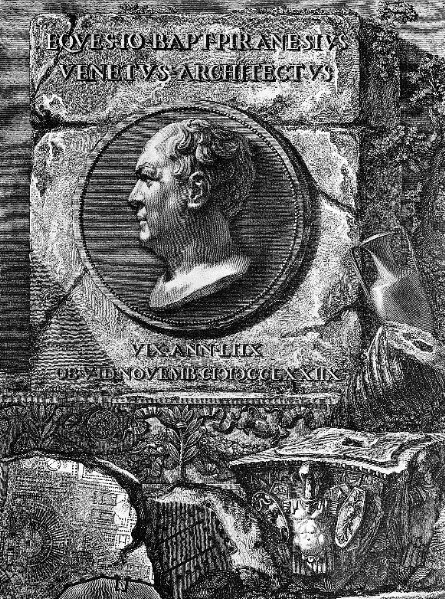 ...could this be seen as Piranesi directly identifying himself with Lucilian as a "modern" father of Roman satire. ...find out if Piranesi has in other cases made a direct connection between himself, his work and satire. There is one engraving called Satirical vignette against Bertrand Chaupy something where an island(?) is made to look like a turd. ...Piranesi moved to the top of the Spanish Steps [hence, within the "Garden of Satire"] the year the Campo Marzio was published (beginning of chapter VII, p. 163). ...Piranesi employing both archeological skills and architectural/urban design skills to engrave the Ichnographia. 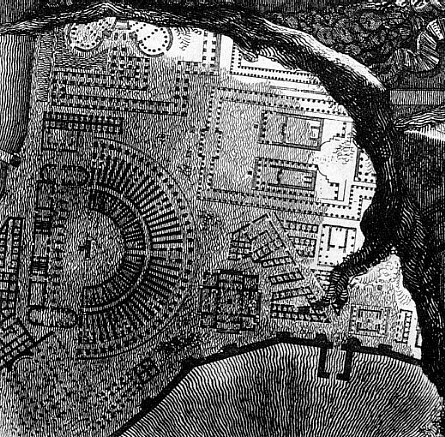 As it stands now, my ongoing investigation and redrawing of the Ichnographia has led to the 'discovery' of a whole new aspect of Piranesi's work that so far no one else has found, namely that the large plan of the Campo Marzio is a readable narrative of Ancient Rome's political and architectural history--but in order to grasp this delineated 'text' one must 'read' in unison the individual plans, the plans in relationship to each other, the plans in relation to where the actual buildings really were, and (this is perhaps the most important) the Latin labels Piranesi gives to each plan. Piranesi also borrowed the devices of Baroque scenographers, heightening the impact of his fantastical compositions of Rome by twisting and turning their viewpoints, creating a confused montage of fragments and spaces, of exaggerated proportions and depth. If Greek architecture was the epitome of purity and restraint, then Roman architecture, so Piranesi surmised, had been erected by plunderers and despoilers, and its compositional forms were not only eroded by time but compromised by choice. Roman ruins were exceptions to the ideals of purity, existing beyond any order that classicists might impose. Their mysterious allure resided instead within irrational and archaic realms. So Piranesi, a bricoleur in search of new orders and new inventions, turned away from those who poked around for the origins of architecture among its ornaments and stones and reached beyond the contemporary zeal for restoration. He moved instead into an arbitrary, utopian, and entirely imaginary sphere of subjective experience. Fantasy holds an essential role in any "analogous city" view, for fantasy is the mediator between an archeologist's mind bent on exploring roots and remnants of antiquity and a creative imagination that quotes and remembers only arbitrary and unrelated fragments and traces. Through incongruous recombinations and imaginary superimpositions, Piranesi diverted architectural symbols from their original meaning. He played an enigmatic game of architectural writing in which reality and the imaginary are confused. M. Christian Boyer, The City of Collective Memory : its historical imagry and architectural entertainments (Cambridge, MA: The MIT Press, 1994), pp. 176-8. The image above left is the Circus of Caligula and Nero as the Ichnographia is commonly reproduced. The image above right is the Circus of Caligula and Nero as it appears within the University of Pennsylvania's (original) copy of the Campo Marzio. 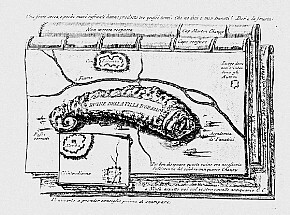 The image above left is the Circus Agonalia as the Ichnographia is commonly reproduced. The image above right is the Circus Agonalia as it appears within the University of Pennsylvania's (original) copy of the Campo Marzio. Did Piranesi himself make these changes, or did perhaps his son Francesco, and if Piranesi made them, then why? Which set of plans were 'drawn' first? Does this 'change of plan' carry any possible semiotic or symbolic message regarding the Ichnographia's larger meaning? Does this physical evidence offer any indication of Piranesi's 'design' method?